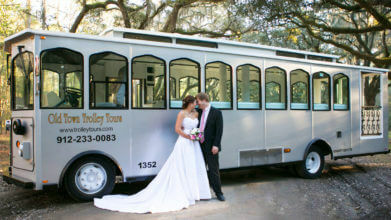 All aboard the Old Town Trolley Tour of Savannah! Join Old Town Trolley as we turn back the pages of time. 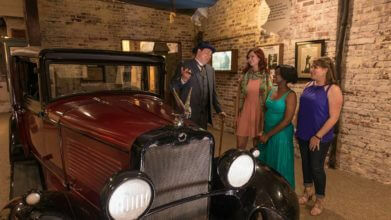 Hear the history, see the landmarks, visit the charming Historic Homes. 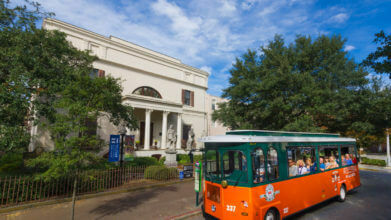 Experience the rich architectural legacy of this beautiful southern town. Located in Savannah’s City Market, it is the first and only one of its kind in the United States. While here, guests will have the opportunity to experience life in America through the earliest rumblings of Temperance through the unintended consequences that the 13 years of Prohibition caused. Built in 1848 for Andrew Low, a wealthy cotton merchant from Scotland, The Andrew Low House is a classic and elegant Savannah mansion. Facing Lafayette Square, its stucco and brick design meshes beautifully with the rich history of the area. Guests can tour the house to see many 19th century antiques, silver pieces and ornamental ironwork. Knowledgeable guides give visitors a wonderful overview of the people and events that had their place in history in the home. Closed at 1:00 pm: Thanksgiving Eve, Christmas Eve, New Year’s Eve.